I think I’ve only listened to this CD maybe 4 or 5 times and it does grows on you.Now there are highs and lows on this CD and I think you pointed them out and again yes we would all love for Jon to comeback but unless a Miracle happens Jon is not coming back. 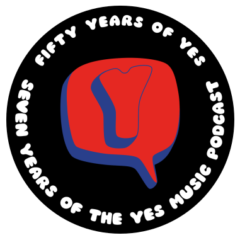 I however believe that Yes will continue to make records but I believe that personal changes are always going to be part of this Prog super group. I also believe that personal changes have been Yes trademark from the very beginning.I believe that Benoit David served the bad well enough and this guy who is going to sing for Yes from Glass Hammer will do fine,however lets face it you can replace only so much of a talent and to say that Bennoit David had the same talent as Jon would be a insult to Jon and the band itself. Yes, Paul, there is only one Jon Anderson! He has a special place in the history of music. It will be fascinating to see how new Jon gets on. As you say, it would be great for the band to go on and on like a string quartet often does with different players. Unfortunately, Yes musicians are giants and almost impossible to replace! Take care and keep listening! Thanks Michael. I like this a lot. Bodes well for the band? Great show, Kev. I was glad to hear what you had to say about ‘Fly From Here’. Although its not my favourite of Yes albums, it was so nice to hear you speak so highly of it. Made me listen to it again and again! Thanks once again, Scott. That’s exactly what I’m trying to do – to get people to listen to bits of Yes they don’t normally, so I’m glad you have found the latest release to be worth a few extra listens! It’s great to have the band still producing, wouldn’t you agree? …and what is with all the people on FB slighting Geoffrey Downes??? That’s really annoying! I couldn’t agree more – he really doesn’t deserve any of the disrespect – he is a great musician and an asset to the band at the moment. Thanks for the comment!